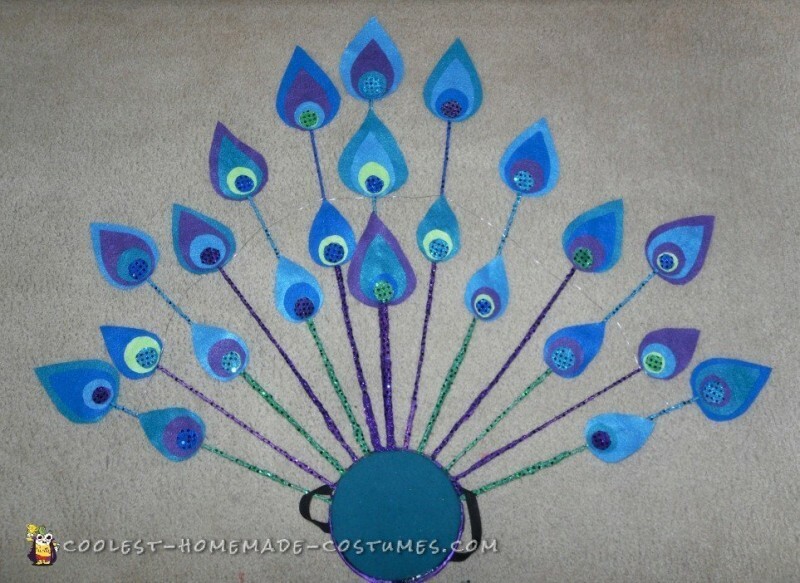 I made this pretty homemade peacock costume for sweet little Princess Isabel who asked me if I could. She learned about how Peacocks fan out their tails and was fascinated with their colors as well. So, being one that is always up for a challenge, I got started by having her show me things that she liked. A tutu was a clear favorite, so I began by choosing tulle in colors that peacocks known for. Some of the tulle even had glitter. I also chose colors in my favorite sparkly fabric, pindot. Slowly, over a week, I gathered all the supplies I needed. I then took samples to Isabel and her mother for approval. 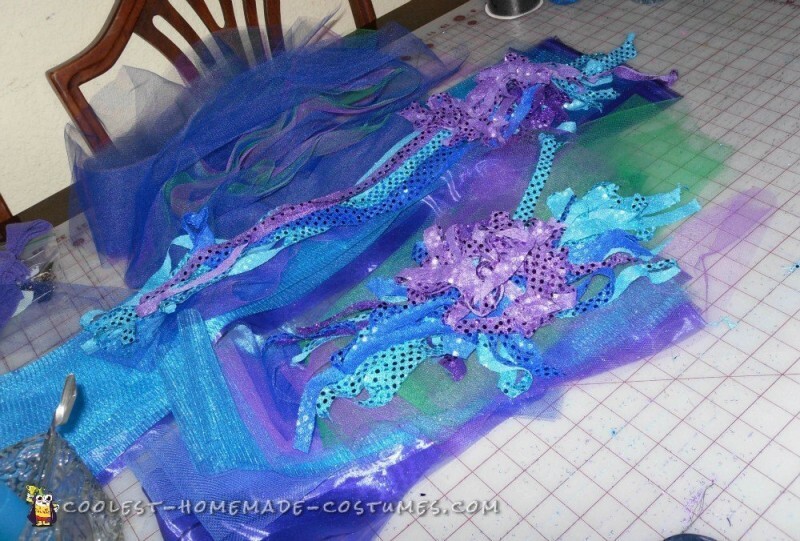 I started with a blue opalescent sequin tube top. Then I made a tutu skirt, looping 4 inch wide strips, short for front and longer for back. I added tulle in different types and colors over button hole elastic (because its soft). Then I cut 1/2 inch strips of a material I call pindot in turquoise, sapphire, emerald, and amethyst, looping them over for added sparkle. I made wrist bands the same way. 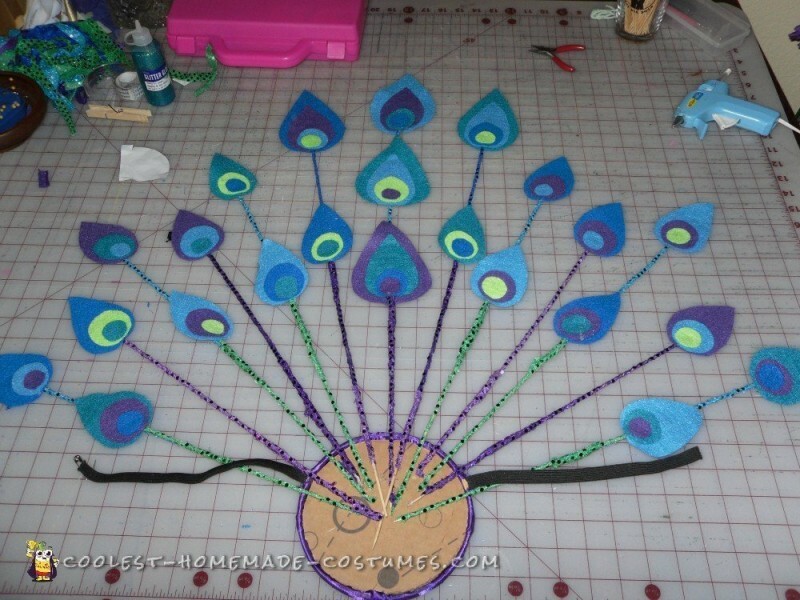 Next came the headpiece of turquoise and purple pin dot in a teardrop shape on a headband. I added a few puffs of emerald, turquoise, purple glitter tulle and a few spikes of pin dot that are wired so they stand and can be shaped. I made a piece I call a necklace to break up the solid color of the tube top. It’s made of turquoise and amethyst pin dot with emerald and amethyst ribbon and a amethyst flower with turquoise pin dot was placed in the center. Making the tail stand up was so much fun. I used a wooden embroidery hoop covered with purple satin and lined with two layers of cardboard attached with hot glue. 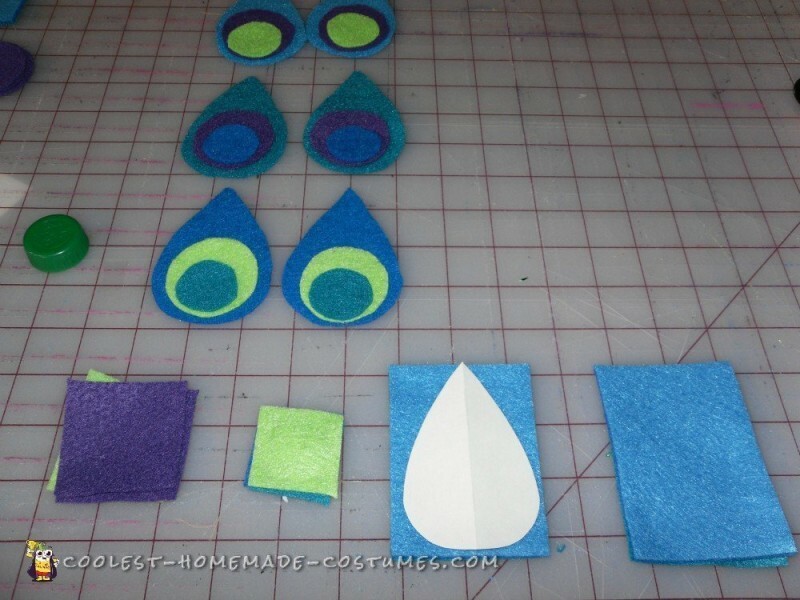 Then I cut felt out of five colors, 23 teardrop shapes with circles, and topped them off with a pin dot circle. Each was attached to a bamboo skewer that was covered in strips of pin dot attached with hot glue. Some of the skewers were actually several attached end to end to achieve the height of the tail/fan. The tail was added using a piece of elastic for the waistband and a plastic buckle attached to the hoop. I topped off the tail with a turquoise overlayed with turquoise pin dot wired bow on the back. I also added a wire half way up the skewers to attach them together and provide stability. I made two extra teardrop felts, one for headpiece and the other for the necklace. Tulle – turquoise, sapphire, emerald, amethyst – 4 inch wide x 30 inch for front looped over 25 inch for back tied at top. Chiffon – amethyst, aquamarine – 4 inch wide x 30 inch for front looped over. 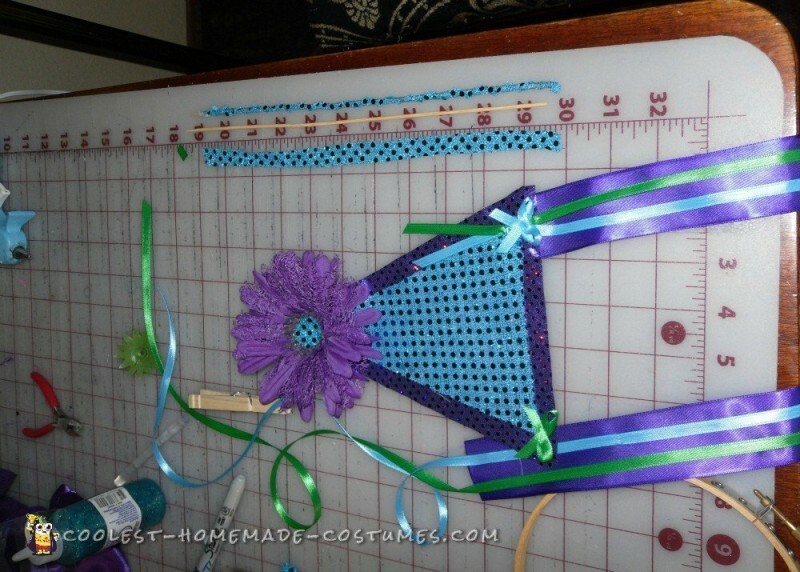 Pin dot – turquoise, sapphire, emerald, amethyst – 1/2 inch strips 12 inches long for skewers, 1/2 inch wide x 16 inch for front x 25 inch for back, 2 triangles in turquoise (necklace and headpiece) and 2 triangles in amethyst (necklace and headpiece). Satin – amethyst for hoop for tail. Felt – turquoise, sapphire, teal, amethyst, aquamarine. Ribbon – satin amethyst 1 1/2 inch wide (necklace), grosgrain turquoise 1 inch wide (tail bow). Button hole elastic – for waist of tutu skirt, wristbands and waist of tail/fan. headband – 1 inch wide, open framework (color to correspond with hair color to blend in). 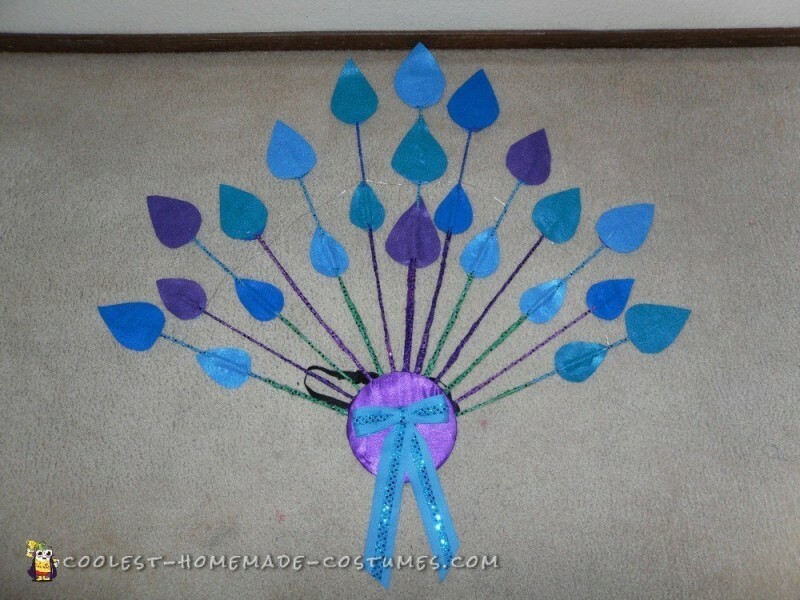 Large Purple Silk Flower – add small turquoise circle in center. Wooden embroidery hoop – inside hoop only. Cardboard – cut in a circle to fit inside embroidery hoop. Floral wire – 26 gauge. Rotary cutter (easier to cut strips). Straight edge for rotary cutter. Have child step into the skirt, making sure she doesn’t step on the streamers. 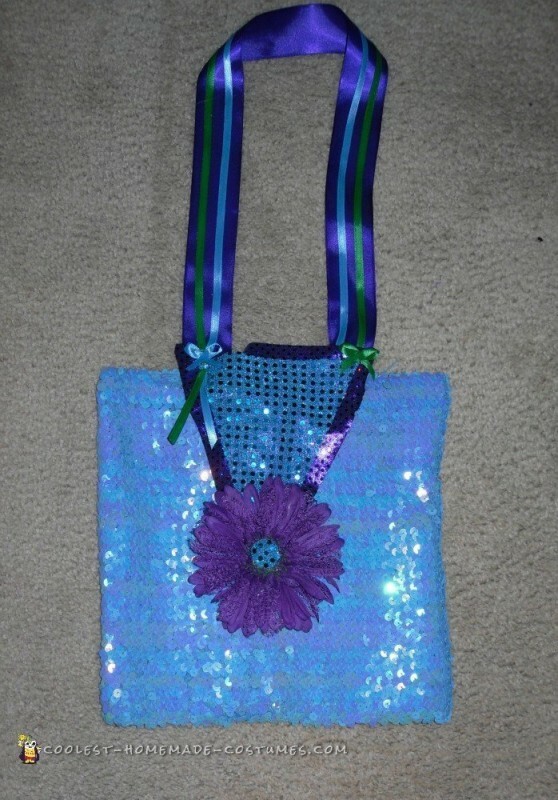 Add the tube top, necklace, wrist bands, headband. Then fasten the tail/fan by clasping the belt in front. 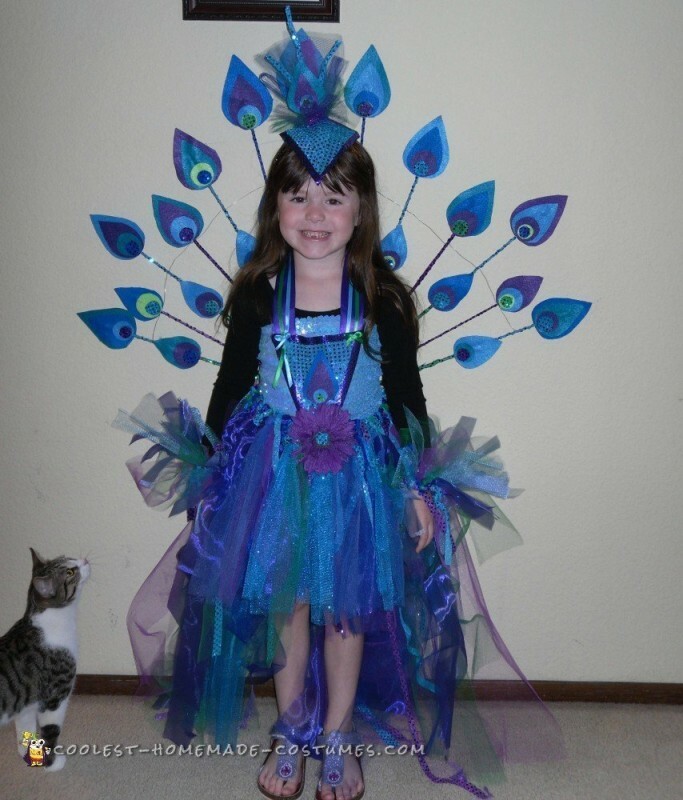 Pretty Peacock is ready to win the Halloween fashion show.